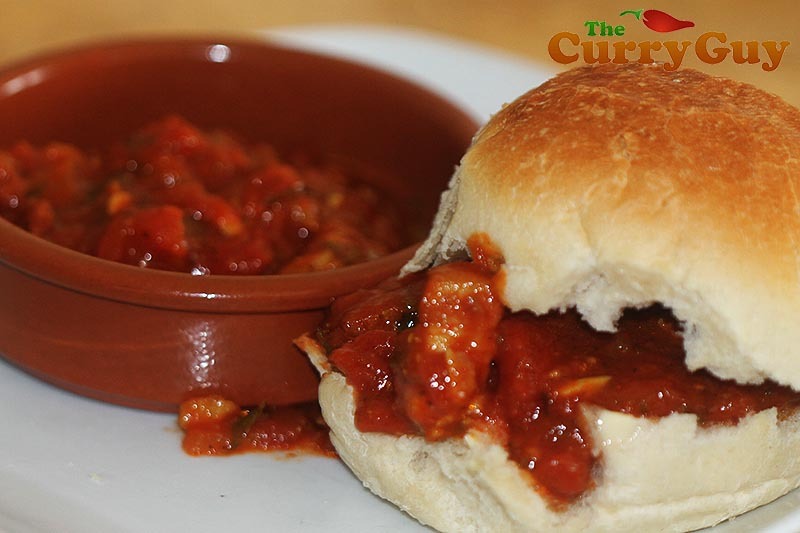 Goan sausage is delicious on its own, stirred into a curry or cooked into a naan. Goan sausage is one of the must-try meats when you visit Goa. It’s like a really smoky chorizo. Like chorizo, it’s so versatile! 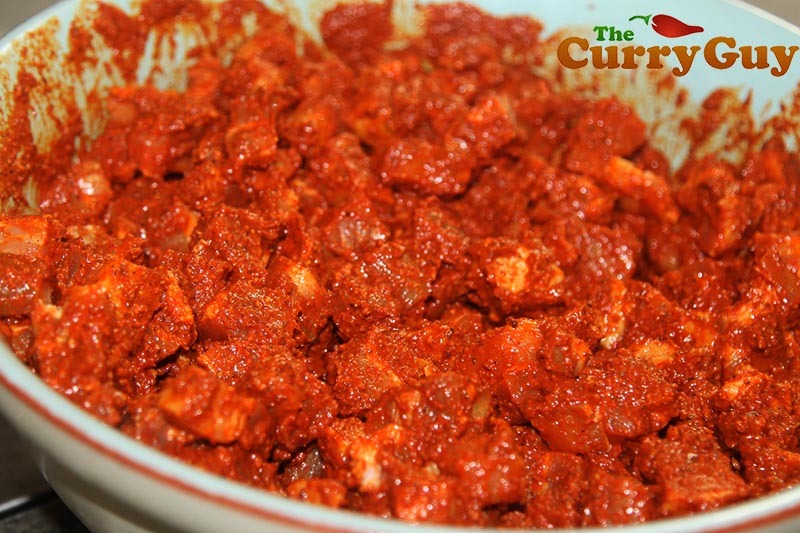 Stir it into sauces, chop it up and make sausage naans (see page 00). If it sounds good, do it. 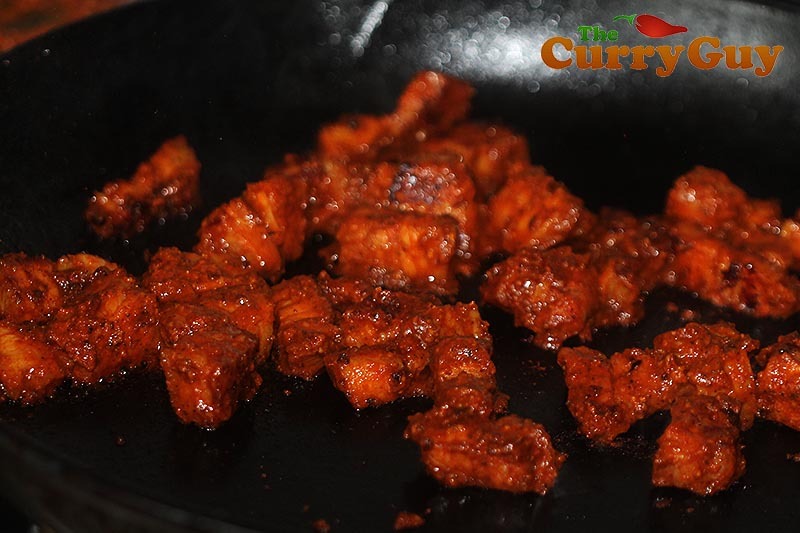 Among other things, the meat is marinated in coconut or cashew feni which is a triple distilled liquor that is only available in Goa as export outside of Goa is not allowed. I’ve drunk my fair share of this cheap booze and can tell you it tastes almost exactly like another triple distilled and much easier to find liquor, tequila which is what I use at home. Traditionally, the marinated meat is then cut up or ground and put into sausage casing before hanging outside to smoke over a smoky fire for a couple of days. 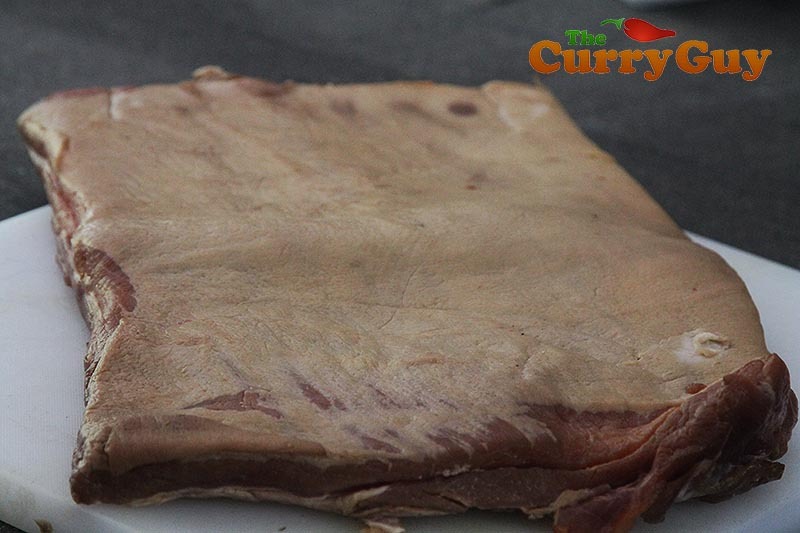 Ask your butcher to smoke a slab of streaky bacon for a few days for you to save yourself that hassle. Ask your butcher to prepare a really smoky slab of streaky bacon for you. Cut the bacon into small chunks as shown. Blend the marinade ingredients into a fine paste. Add the paste to the bacon and mix well to combine. For best results, marinate for at least two days. You could cheat though without much loss of flavour. The cooked meat can be used in so many ways. Here I stirred it into an onion and tomato sauce and served on buns. 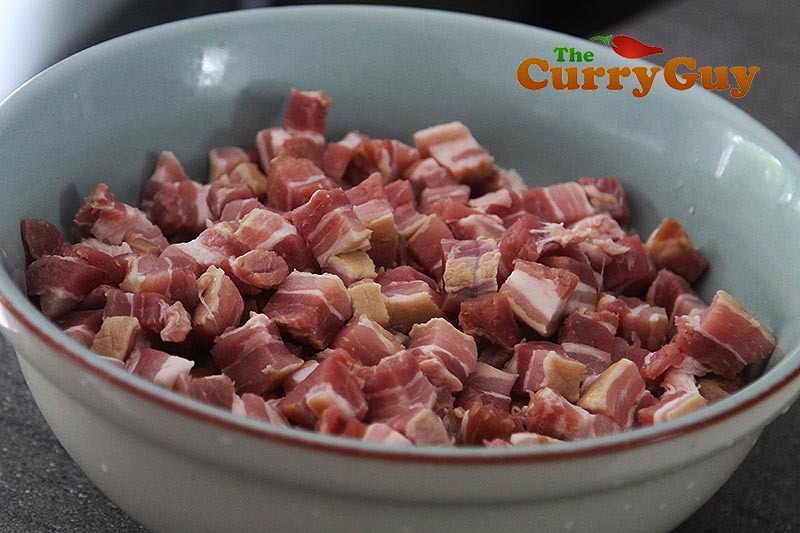 Cut the bacon into small cubes and place in a large bowl. 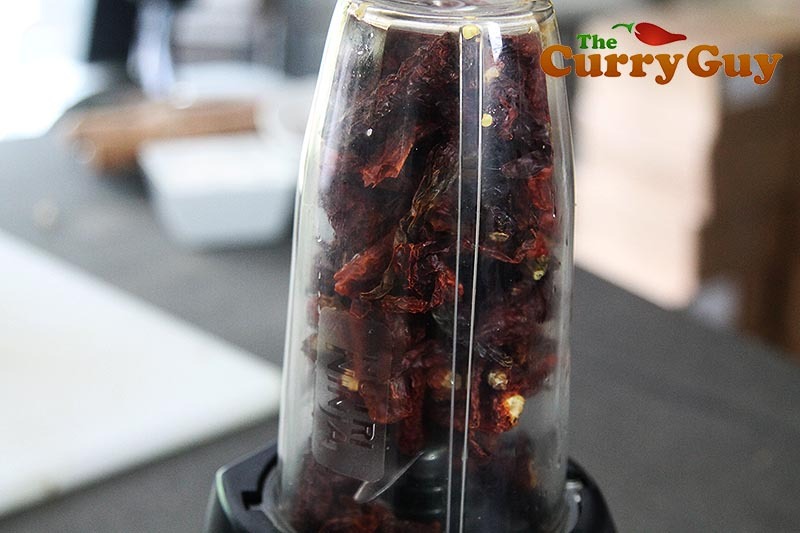 Blend the Kashmiri chillies in a spice grinder or blender and grind until you have a fine powder. Add the cumin seeds, cloves, black peppercorns and turmeric and continue grinding until you have a fine powder mixture. Add the garlic, ginger, vinegar and Tequila and blend into a smooth paste. It should be thick and just pourable. If too thick, add a little more Tequila or vinegar. Pour this all over the bacon cubes and mix well. Allow to marinate for at least three hours. Freeze what you aren't going to use within three days in small portions. When ready to cook, heat a pan over medium high heat and fry the bacon until crispy and cooked through.